Yoga for Pregnancy is the perfect practice to help you stay active and fit during all stages of your pregnancy. The meditative aspects of this practice will help you to prepare for labor and childbirth and includes visualization, connecting with your breath and deep relaxation. Length: 1 hour 15 minutes. 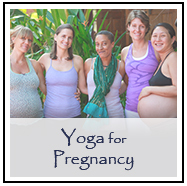 Instant MP4 digital download of the Yoga for Pregnancy DVD.